As a volunteer mate on the charity's fleet of four 72ft ocean racing yachts, I'd taken hundreds of youngsters like Derek out to sea so they could build self-esteem and learn the importance of teamwork and following orders. The tried and tested principle is that kids who have committed minor crimes, or are on the verge of doing so, are inspired and motivated to change their life before it's too late. The success of schemes using sail training, martial arts and rugby may have been in the Prime Minister's mind when she headed a knife crime summit on Monday and declared that the country "could not arrest its way out of trouble". Greater use of stop and search will certainly take many knives off the street but it won't address the underlying cause. Young people need to feel valued so they're incentivised to live by society's values. It's what Tall Ships excels at. But Derek was a tough nut to crack. Shoulders hunched, head bowed, he lived inside the silent world of his hoodie for the first three days. While the nine other kids aboard revelled in steering the boat and enjoyed working as a team changing sails and pulling ropes, Derek sat alone, hardly lifting his eyes from the deck. Then on day four it all changed. The skipper decided we'd give them a taste of the open sea by sailing round the Isle of Wight, quite a baptism for first-time sailors on a windy day. As the sea got rougher we needed to reduce sail, so I asked for volunteers to come with me and work on the heaving and wave-soaked bow. I told Derek I needed his help as he was the only crew member strong enough to pull down a sail. The flattery worked and grudgingly he agreed. But as we changed the sail, a piece of rope jammed, putting the boat at risk. "Quick, get me a knife," I shouted at Derek. And to my amazement he pulled one out from under his lifejacket. There was no time for questions, that rope needed to be cut. Derek had saved the day. As I heaped praise on him, he broke into an enormous grin. Soaked to the skin, we engaged in a man-hug before I gave him back the knife, saying: "You don't really need this, do you?" He thought for a moment then tossed it overboard. For the rest of the voyage he was a different person - helpful, happy, confident, engaged. Proud of himself, in fact. I see transformations like this almost every day. We take hundreds of disadvantaged young people to sea each year. They have had the most dreadful start to their lives and are bereft of self-esteem, self-confidence, social and team-working skills. They feel utterly worthless and without any prospects in life. After a week under sail, empirical evidence shows that their view of themselves - and their prospects - has dramatically improved. This is because there is something unique about life on a sailing ship. For a start, there is no escape. Everyone has to be part of the team. Everyone has to pull the ropes, climb the mast, clean the loos, steer the ship and do the cooking. This, and the lack of mobile phone coverage at sea, has an incredibly powerful impact. Testimonials from those leading the youth groups, youth offending teams and pupil referral units all indicate that sail training achieves more in a week than could possibly be achieved in six months with land-based equivalents. It is quite remarkable. 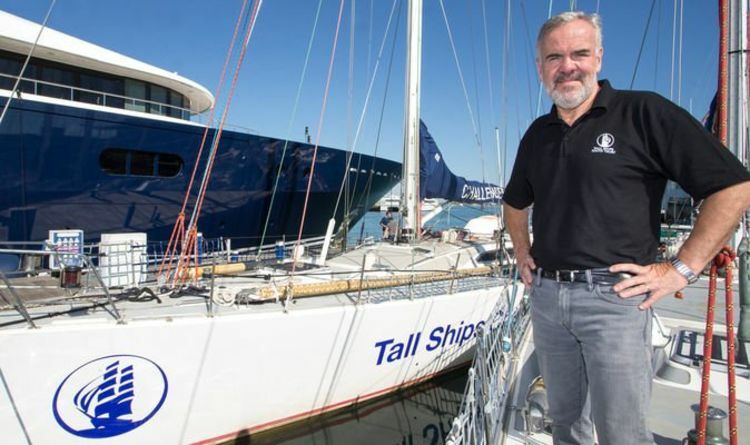 In a major breakthrough next month, a group of youngsters from Liverpool will sail with Tall Ships on a voyage paid for with money the city's police and crime commissioner has raised from the sale of jailed drug dealers' property. It is the perfect virtuous circle. Crime, retribution, re-investment, prevention. The people who lead young people down the paths of destruction are punished and the proceeds of their crimes are used to give their potential victims a positive boost to their lives. It is the kind of joined-up thinking that the Government should be more engaged in. Spending money on young people to encourage them away from a world of gangs, drugs and violence would save money spent on the police, the courts, social services and the NHS. Meantime, it is down to charities like Tall Ships to raise millions to provide more opportunities for young people. You can help. Go to www.tallships.org. Think of Derek and what a week at sea did for him.